Firefox's Safe Mode is a troubleshooting mode similar to the Safe Mode feature of the Windows operating system. It basically launches Firefox in a default state which can be useful if something is not working and you want to make sure it is not add-ons, customizations or themes that is causing the issue as they don't get loaded in Safe Mode. The easiest way to start Safe Mode in Firefox is by holding down the Shift key on the keyboard before you start the browser. This displays a prompt to start Firefox in Safe Mode or Refresh the browser. You can launch Safe Mode with a parameter as well. All you need to do for that is to run Firefox with the parameter -safe-mode. This can be done from the command line for example or by creating a special shortcut that uses the parameter. Last but not least, you can restart Firefox in Safe Mode by clicking on the Hamburger menu icon, then on the question mark icon, and selecting the restart with add-ons disabled option. 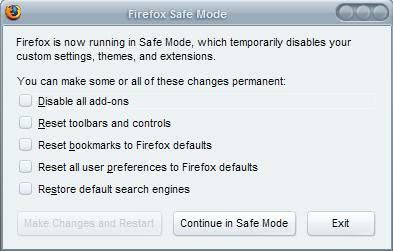 A box titled Firefox Safe Mode is displayed either way. This box not only allows you to start Firefox in Safe Mode by clicking on the button Continue in Safe Mode but provides access to options to reset certain Firefox customizations. Firefox will not load any themes, extensions and toolbar customizations in Safe Mode which is great if you are experiencing issues and want to quickly compare if they are related to extensions or themes. The Safe Mode can also be used to disable all add-ons temporarily to find out if they block you from starting Firefox at all or are causing other issues during start. Reset Bookmarks to Firefox defaults - all current bookmarks get removed and the default Firefox bookmarks are added. Reset all user preferences to Firefox defaults - All firefox options will be reset to their default values. Restore default search engines - All default search engines that have been deleted will be added again. It sometimes makes sense to create a new Firefox profile instead and start a new. The article explains how to launch Firefox in Safe Mode and what you can use the mode for. It lists all methods to launch Safe Mode. Please anyone tell me how to get out of the safe mode so that the browser doesn’t ask me to continue in safe mode or not every time i open the Firefox browser. I am sick of it. Please help. Thanks in advance.